ZACK LIEBERMAN has won Webby and Emmy Awards for his past work and was featured as one of Filmmaker Magazine’s 25 New Faces of Independent Film. Zack is currently based out of Brooklyn, USA. You can follow Zack, see more of his work, and learn more about his past and future projects at zdLLdz.com. 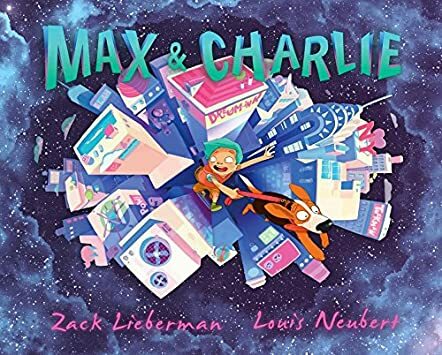 Put on your mental shoes and get ready for an adventure of a lifetime through the eyes of a little boy and his dog in Zach Lieberman’s latest work: Max & Charlie. Whirl through New York, meet various characters and hear their perspectives on life, from hobo to high fashion lady, from punk troublemakers to “righteous and orderly” New York Police officers. And dashing through all these is little Charlie, whose main goal in life is just to catch his dog, but whose senses are constantly being bombarded by the sights, sounds, and interactions with other humans in this path called life. All these adventures are brought to life in front of our eyes by the marvelously talented Louis Neubert. We switch between our view of the situation and Charlie’s. Beautiful work! Poetry of sight and heart. When I first saw Max & Charlie, Louis Neubert’s illustrations on the cover really jumped out at me. And the pictures inside the book really pulled me into the first couple pages. Then I really got into Zach Lieberman’s tale and the drawings and story swirled together into an intriguing fusillade of colors and drama. If you choose to pick up this book, you will meet people who are warm-hearted and kind, those who are emotionless and power hungry, those who are too philosophical for earthly good, and those who are so mindful that you can’t help but grasp a new view of life from just a few pages of riding with them. This will definitely made you ponder life in a new way.